Born in Calgary, Alberta, Barbara Weaver-Bosson expressed an artistic inclination from a young age. 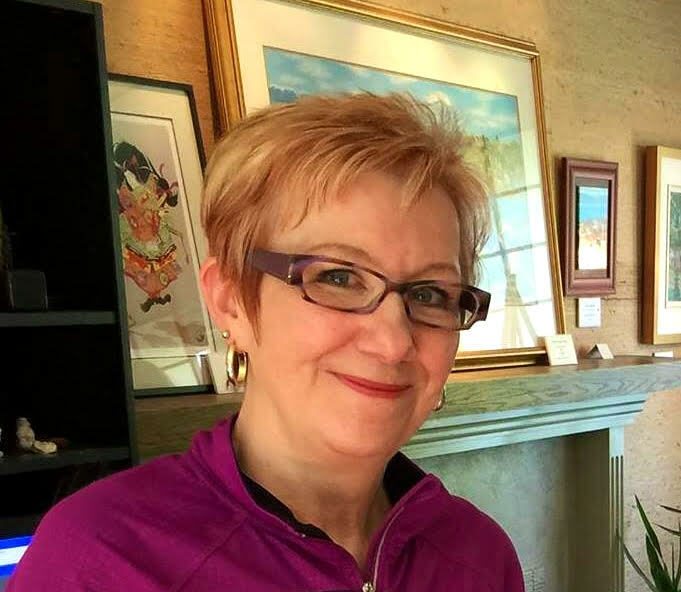 Her exceptional talent in drawing and encouragement from family and teachers led her to pursue a degree in Painting at the Alberta College of Art at the age of seventeen. There, Barbara developed her interest in landscapes, and practiced many mediums such as sculpture, printmaking, drawing, figure studies, and communication design. After graduation, she collaborated with other artists, including her husband Victor, on fanzines and comic books. 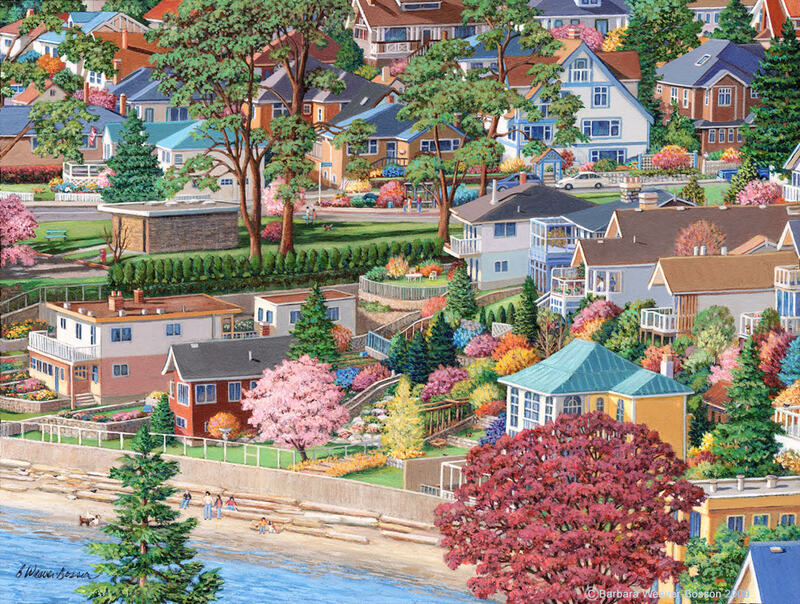 After moving into Victoria’s Fairfield neighbourhood, Barbara experienced an artistic epiphany and the landscapes of Victoria, from Beach Drive to Moss Rock and Gonzales Hill soon became the inspiration behind her paintings. While walking in these areas, she photographs, sketches, and wanders to different vantage points to gain a sense of the landscape. Her most well-known works are from her Neighbourhood Series, a project that she has been adding to for over thirty years. Her works explore themes of community, nostalgia, place, and perception. To meet the growing interest, Barbara began creating art prints of her paintings in the early 90s, and has since expanded into cards, which are for sale in many shops locally. In this conversation, Barbara speaks about her experiences as an artist, the Neighbourhood Series, collaborating with her husband Victor, and her relationship with the city and people of Morioka, Japan. Edited and transcribed by Emily Mall in consultation with Barbara Weaver-Bosson. Text in square brackets indicates additions or subtractions from original interview as recorded in the audio file above. Emily Mall: My name is Emily Mall, I’m an undergraduate student in Art History and Visual Studies at the University of Victoria. Today I’m joined by local Victoria artist, Barbara Weaver-Bosson, and today’s oral history is part of the Pacific Northwest Women Artists Oral History Initiative led by Dr. Carolyn Butler-Palmer from the University of Victoria. I’d like to start the conversation asking a bit about where you’re originally from. Barbara Weaver-Bosson: I was born in Calgary, Alberta, and I grew up in a wonderful neighbourhood called Shaganappi, which is a community in southwest Calgary. It was a very exciting place to grow up as a child, and there was a lot of activities at the community association centre, lots of places to ski and toboggan, and just visit your friends, run around the neighbourhoods. We had a lot of freedom as children. Barbara Weaver-Bosson, Gonzales Bay Revisited, 2014. From the original acrylic painting titled A View From The Terrace, 1995. EM: When did you know that you were interested in art? Was it from a young age? BWB: Yeah. I liked drawing. My grandmother was a painter of watercolours, and she did Alberta landscapes. Unfortunately, I didn’t have a chance to meet my grandmother, and she had the best name, Myrtle Weaver, and she passed away before I was born. I regret the fact that I haven’t had a chance to have had her friendship or to see her work in her watercolours. But we do have films about my grandfather’s adventures with Myrtle, out near Banff, painting near the Bow Falls and the mountainscapes. There is some historic reference to the grandmother that sort of passed on her creative genes to myself and my brothers. Everybody in our family had talents, and so we were always encouraged to do art. I love to draw and paint. Painting came later actually, but drawing with brightly coloured pencil crayons. BWB: Everything reflects in whatever your interests were as a child, it eventually matures into something more exciting, but I loved to draw horses and I was very much into, later, drawing portraits of my favourite rock stars. There’s always a transition as a child to a young adult, to a practicing artist, but so I was always drawing, and then later painting in my room. That just was always encouraged. EM: From that interest in art, how did you decide to get artistic training and go to school? BWB: They gave me all the credits I needed to attend the Alberta College of Art in 1970. BWB: They just said, “Fly.” I felt that was very progressive of the school system, to see where my talents lay, and felt that it was beneficial to let me go early and get into art school. Having my brother already graduated and he did very well in art school, and got scholarships, and so I was Ross’ little sister at art school, but we were so different so I think we stood out as individuals, because he was more about sculpture and I was more about painting. EM: That’s interesting because if somebody says that they want to be an artist, there’s usually a lot of questioning about that path, but you were given just the wide opportunity to go and go for it. BWB: Oh, it was amazing. Once I reflected back at how lucky I was, because a lot of parents would generally steer their children towards more academic studies or professions that would help support their lifestyle or their family, depending on how they chose to live. But we were all about being … Well, my parents were self-employed. They were good role models. They had their own business and they were both very creative, and my mom would hand-paint furniture that my father would restore, antiques, and she would do decorative folk art patterns on all sorts of different types of furniture and butter churns and milk cans. They, again, just showed us that we could probably choose a life that was based on what our interests were, and it wasn’t all about studying to be a doctor or a lawyer or whatever. EM: You go to school for art, how did you decide you wanted to make it a career? BWB: I don’t think I thought about having a career as much as just being able to paint and find a gallery. Every artist’s dream is to find a gallery that represents them, and I became very independent in that thought, where I pretty well, even though I made a living when we moved out here to Victoria from Calgary in 1975, Vic and I both graduated from art school, and I wanted to work enough that I could buy art supplies. Then so I worked at a few art stores and loved that because I’m immersed in materials and wonderful people who are coming into the store and enjoying all the materials that we had to offer, and paints and framing supplies, and all the creative graphic designer stuff. BWB: I just loved my job working at Island Blue Print and Wales Art Supplies, and even Victoria Book and Stationary for a short while. Again, you’re meeting the community of artists that come and go, and the designers, the architects, the engineers, and it was just a very good base of a business sense and what other people were doing in the art community. If they were just painting or they were designers, or they were very intent on [architecture] or engineering. It was just a great cross-section of meeting different types of creative people. EM: Yeah. Did you ever teach any classes? BWB: I taught courses for two summers at the Alberta College of Art, and I loved that because I had kids from nine to sixteen. Two different courses, one in the morning for the younger kids, and the afternoons for the older kids. We took field trips for sketching and we did lots of painting. I had an unlimited budget for materials for these kids, and so I think because of my own sensibility about playfulness or colour, I got the kids illustrating pictures of little stories I’d write. They had a different opportunity not to just draw a static still life or a tree or something, it was more about using your imagination based on a little bit of a paragraph that they could embellish in drawing or painting, with their own take on it. BWB: Yeah, so I had fun. That was teaching at the Alberta College of Art, and again, I was quite young and loved to share. It was pretty flexible. I’m not a real educational expert, but it was more about getting the kids to think differently. I think the boys would be stuck on drawing cars and the girls might enjoy doing … I think the girls were a bit more creative. I think they had a bit more variety of imagery that I could see was developing in those two different age groups, but the boys had this very sort of narrow idea of what was their expression. I tried to take them out of that a little bit and get them to think outside of action. BWB: But so here, I’ve thought if teaching courses through Camosun College, and I felt that no, it was a little too early for me to do the public night course teaching, and just kept painting. I would work during the day and then paint at night, paint on weekends, and I found some really good galleries that started showing my work. By 1986 I was doing quite well and I quit my full-time job to paint. EM: What galleries exhibited your work? BWB: North Park Gallery and Nunavut Gallery, and the galleries come and go unfortunately. There’s still some good galleries around town, but we all know each other. We all know each other from that era where people were establishing themselves as artists and/or gallery owners. Yeah, it was great. EM: You went to school in Alberta, how did you end up in Victoria? BWB: Myself and Vic [Barbara’s husband], were very keen to come out to the west coast, and our friend who also attended the Alberta College of Art was a comic book artist by the name of John Byrne, he’s very famous, and at that time we were all thinking about coming out here together, and we did. We did come out here together, and John was our employer, and he would hire Vic and I to help on his comic books that he was doing for Hanna-Barbera and some fanzines. John’s star was rising as a comic book artist and he was getting some work. BWB: Even Emergency, there was a comic book that we worked on with John, Emergency, which was after a TV show, so a version of the TV show. We developed some skills for illustration, not that we were doing the illustrations, we were doing backgrounds and such that John was happy to have us help. So, John and Vic and I were a team, and then John heard the call of New York or Toronto, so he made his way into the comic book industry and stayed in the US. Yeah, so it was nice to see him do well, and Vic and I did our own thing. You find things that just interest you at the time and you develop new skills, and different skills for a creative person are always beneficial. EM: I’m wondering what your creative process is like. BWB: Well the one that I developed that seemed to work for the way that my brain works and my painting style is that I do a lot of research on a site that I want to paint, and I spend time up on the rocks or on the beach, or finding an elevated view that I prefer. I’m always looking for rhythm, colours, patterns, a nice balance of homes and residential area and some water. Water’s not always essential, but I love the way that the coastline wraps around the residential areas, and then the backdrop of the mountains, say the Olympic Mountains or Mount Baker. There’s that element of I’ve got a framework, I’ve got the sky, the mountains, the water, and all the beautiful residential areas that I love to roam in. EM: What in particular inspires you to paint a scene? Is it just a feeling? BWB: Yeah, I think it’s a rhythm of the buildings I’m looking at and the faces, the roof lines when I’m talking about the elevated views that I choose, so there’s character involved. I love the different types of character in the homes. There’s something very simple, humble homes and there’s more grand homes that are all nestled beside each other, along some of these viewpoints. I like the character of some of the homes and it just attracts me. It’s like patterns or rhythms and charm. 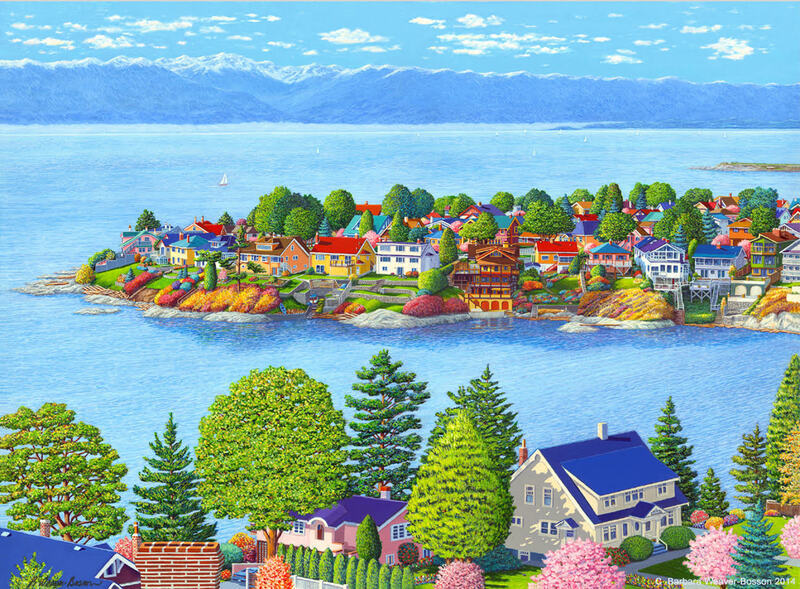 Barbara Weaver-Bosson, Springtime – Gonzales Bay, 2009. Acrylic Painting. 12 x 16 inches. EM: How long is the process of making a painting for you typically? BWB: It’s hard to say. I would probably, for a number of years, I would release one large image and then I could reproduce it and take it to prints. That way, I could share that investment of all my time with the public, and that was something that worked out really well for me. Because I would invest up to eight months in a painting, that has changed now because my views are getting more and more complex, and I can’t really put a real time figure on how much time each painting takes because I’ve a variety of different roles in my life. I work with Vic on various collaborative projects, and so I’m dividing my time up with my painting, my gallery distribution for prints and cards, and any promotional work for blogs or website stuff. It’s a big time investment, but it’s all pleasurable, and I can’t really say any more, how much time it takes. It takes as much time as it takes. EM: Your colours that you use in your paintings are very bright, have you always leaned more that way? BWB: Yes. I was very upset as a child when we were given in grade one, a package of crayons and they were made out of, I think clay and a bit of pigment, and maybe a little bit of wax. We were given these outline pictures to colour in, in grade one, and I picked up these crayons and I was just so mad because they didn’t have any real pigment or saturation or depth, and I could feel myself getting a little agitated. “What are these things? They’re terrible. There’s no colour, there’s no pigment.” I’ve always loved the idea I can saturate something when I’ve got the right materials and the paints. Yes, I would say it goes back. All my drawings in school probably had a good layer of pencil crayon on them once I got the good pencil crayons, and not those awful crayons. EM: How do you know when a piece is finished? 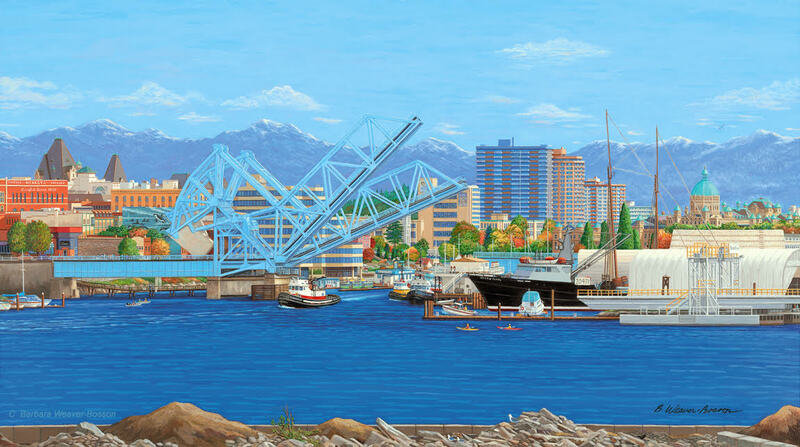 BWB: I think, as you saw in my studio, there was that piece in progress, it was the very complex view of the Gonzales Bay and Downtown and Ross Bay, and looking towards the Triangle Mountain and that Metchosin area. I’ve got several, several layers of information about my community in there, and what was the question? BWB: Right. You could see that I finished the houses as I go, and I fill in all the trees, I make all my detail, so it’s a very basic line drawing, and so once I feel that all the balance of colour is, and the houses are the right kind of tones and patterns that I like for the eye the travel through, these very complex visual mazes in a sense, that I just keep working on it until I go “Okay, I’ve got it. I’ve got the water the way I want it, I’ve got the sky the way I felt that the day should be,” so I just keep working until I’ve got all those nice balances. If I feel that something is glaring and it stands out, or something doesn’t feel finished, I think that’s the method I’ve developed so that there’s that feeling of everything balanced, and then I can say it’s finished and I can show it off. EM: We’ve been talking about your images of Victoria, what can you tell me about your Neighbourhood Series? BWB: Well the Neighbourhood Series started in my head as a child, because it’s funny how I love to walk around in the neighbourhoods. Because my friends were scattered all over within about a good eight block radius, because we all attended to same school, but we would visit each other’s homes, I loved walking through the neighbourhoods. I love looking in people’s yards, I love looking at the window frames and all the stuff that they had in their gardens, or how basic that they kept their houses. It was just something in my mind that I was very much analyzing, and so when we moved to Victoria, I just couldn’t believe my luck. I looked down from Moss Rock onto May Street, over towards Dallas Road, and all the neighbourhood just spread out before me. I said, “I can see life going on down here,” like I did as a kid, wandering around on the streets looking at life and my friend’s houses, and their neighbours. BWB: I think the neighbourhood was in me for a long, long time, and as soon as I moved to this part of Victoria, there it was. It was like whoa, an epiphany. Yeah, so that, it just struck me like a bolt of lightning. Really, it did. It was like “Whoo!” Those are those moments in any creative person’s life where they realize that this is a very serious moment, and nothing’s going to change the way you feel about your next investment of this. The series, that’s why I called it the Series, because I’ve been doing this for 30 years, this whole series. I’m just still excited. EM: The paintings inspire a sense of community, do you find that people from Victoria, when they look at your artworks, find a special connection with them? BWB: I think there’s a lot of familiarity about some of the architecture that you may have grown up in or around, and some of the ages of the houses, and even if you didn’t grow up in Victoria, but you look at some of these neighbourhoods, you go, “Oh man, my friend lived in a house like that,” or, “There’s that park. I just love that park,” or by the ocean, “Oh, we used to spend time sitting in the bench down by the ocean.” It’s a connection with possibly places you’ve been, feelings you’ve got, and like myself as a child, the feeling I got about being in a community where everybody knew each other. I felt the same way when I came here. I’m hoping that people will feel a sense of familiar connection to the homes or the neighbourhoods that they themselves grew up in, that are very familiar. Yeah, it’s a deep, deep connection really, for me, and I hope other people are connecting similar. EM: Neighbourhoods often change over time, how do you respond to the changing architecture in Victoria? BWB: There for a while, things weren’t changing, and I would get up on Moss Rock and I’d start to look around at some of my favourite little pockets of houses that I would paint. I could see some renovations happening, I’m went “Oh, that’s different,” and then I would go down to the street level and went “Oh gosh, they changed the front of their house.” It became an expansion of how communities develop, and I figure well [in] every single community, there’s been pockets of development, house styles from a certain era mixed with another group of developers that come in, and they’ve got another sense of design styles that are always moving forward, and I thought well if we wanted to keep our community as it was when we first moved here or grew up here, then I think we would have to develop a theme park that had the style of homes that you dearly love and would love to live in, and everybody lives in the theme park of their own choice of architectural style. BWB: But that would be unrealistic, but I think I love all sorts of architecture. I love the modern, I love the looking back into the art deco time period, and I love character and I love cabins, and I love little boxes. I think every community’s made up of different time periods of how a designer or a developer was thinking at that time, and so it’s hard to stop change. I really kind of feel sad when some of these old buildings are removed and there’s that sense of place that is no longer there. The tress are gone, the feeling of the wood building or the stucco building, or now they’re a little bit more dramatic and more dynamic lines, and so they stand out in the neighbourhood for sure. BWB: But I might be able to live in one of them quite happily, so I think every designer and every person who studies architecture will always be encouraged to look ahead. They, even though they may have a favourite time period of architectural styles, where a lot of architects would be very influential, and maybe some of the new designers are taking bits and pieces of different historic styles and adding them into their own. Yeah, I’m a big fan of architecture and I just love looking at it all. No matter how humble or grand, I love looking at it. Barbara Weaver-Bosson, Beach Drive Revisited, 2014. From the original acrylic painting titled Beach Drive, 1998. EM: Some of your images, you’ve revisited, what is that process like? BWB: I think there’s something magical about some of the areas that I keep [being] drawn to, and it’s, again, about a rhythm or a pattern or a sense of place. I’m quite happy to note some of the changes that have happened in that area, and [add] some of the new buildings, or it depends on my mood, if I’m going to add that new building or keep the old house that was there from a past photographic reference. But the photographic reference I have, again, is like a stockpile of historic … From the early 80s until the present, I’ve captured, in photographs, some of the areas that I just [was] thinking about painting, just because I needed it at the time or liked to have it as a backup reference for my reference to something that’s either changing or staying the same. EM: They’re like a time capsule. BWB: It is, it is. I love wandering and I could snap a thousand photos, but I don’t necessarily want to paint them all. EM: You use many of your photographs for reference. BWB: Yeah, it helps me. I like to do sketches on location and get an overall view or composition, and then I’ll keep revisiting that area [until] I finalize what it is that I want to include in my view. I’ve often, in public art, like say the Moss Street Paint-In, a couple of people would up to me and say, “I live just off your picture, right there.” Oh darn. I should have given them one more degree of that line of sight. “I just live around the corner,” and I just feel I would love to paint the city, I really would. EM: Yeah. If you could fit it all. BWB: Yeah, if I could fit it all in, but the one I’m working on now, it almost does. EM: Your paintings include really small details of cars and people and dogs and ducks, and how do you decide what you keep in and what you leave out? BWB: That’s interesting because generally the line drawing, I finalize and I feel that it’s ready to transfer on to my board or my canvas, it doesn’t have all those tiny details in it. I will add them as I go, and again, it’s all about my mood and what kind of a playful mood I have that day. Occasionally I’ll put our friends in and myself playing tennis down at Hollywood Park with my friend Anne, and myself with our dog down at the waterside at Gonzales Bay. I’m telling little stories, so when I start adding people and characters, and they may have already been in the scene as, say I snapped, but I think I tend to use my imagination, and I’ll use my imagination for colours and for little things going in the street or the beach, or whatever. I think I like the idea of telling stories and little groups of people and things, in boats. EM: You’ve been a part of the Island Illustrators Society, what can you tell me about that? BWB: The Island Illustrators Society has just been a great connection for us, and that started in the mid 80s, 1985. I think Vic joined and I joined in ’86. So, Vic being a storyteller and illustrator at heart in the sense that he loves to tell stories, whether it’s several pages or just one little moment in time, in a character’s life, but it just was a great collaboration of professional ideas and how to navigate the waters of being a creative person. It mostly was about designers and illustrators, and developing a professional connection to our community. We had some great shows and great meetings, and we would meet in a variety of different places, at North Park Gallery when they were on Store Street, and the Art Gallery of Greater Victoria, and then we would find other spots depending on if we couldn’t afford the space. Even at Camosun College, we had a space there for our meetings. BWB: But it was always about developing the creative person and a sense of maybe [being] able to understand contracts that you might be doing with a publisher, or maybe just handling a situation with a client that would be best to your own education to know how to talk to people when you were doing something creative for them. It was just great. Those lifelong friendships we developed at the Island Illustrators Society are just solid, and it’s evolved and changed. It has a lot of different creative people in it, and I think groups are great, but after a while, we found that we got too busy and we needed to just focus on our own projects. BWB: The group thing is great, but there’s a lot of commitment for being an executive with the group, but you always have a … In your mind, you want to make the life better for artists. You want to make them understand the world of business a little bit, and how to protect themselves and how to just navigate the waters of being a very unique individual in the world of business. EM: Is the society still going today? BWB: Yes. It has, I think, a small group of people that always formulate projects, group projects during the year, and discuss business. [There are] some amazing illustrators and creative people that have come out of the Island Illustrators Society, and Grant Leier and well, Nixi wasn’t a part of group, but she was a friend of ours, and Ken Campbell and Ron Lightburn who’s an amazing Canadian illustrator. So many of us strived, and we found our way in a comfortable place in the arts community. EM: What changes have you noticed in the community over time? BWB: I think it’s with technology, there is now a way of artists to reach out to the world now. With what we had when we were first moving here was it was mostly about word of mouth, if a gallery had any of your work, then they would put it up on their walls and maybe talk about you. But you couldn’t really be sure how that would benefit you in the long term, so I think with technology, you have a website now, you can do lots of public events, and I think it’s better. You’re not so isolated like you were back in 70s, 80s and 90s. I think it’s changed remarkably. EM: Do you feel that the art scene in Victoria has gotten better over the years that you’ve been here? BWB: I think so. There’s more variety. When we moved here in ’75, it was pretty sleepy. There was only a few key galleries, private galleries, and then the Art Gallery of Greater Victoria has always been a benefit to artists, and the art rental system through the Art Gallery of Greater Victoria is such a good program, and that helped us get our work out there. That really made a difference. EM: What role do you think artists have in society? BWB: I think the world couldn’t live without artists, and I think their role is huge. It runs the entertainment industry. All these creative people are just thousands and thousands of very skilled people, make our lives happy, they make them more interesting, they design environments for us to visit, like Disneyland or a stage play. Without creative people, this life, I don’t think, would [be] very interesting. No, I think the role of artists is just tremendously underrated. We should be held up in higher esteem on a regular basis. BWB: The people who run these industries, that hire artists, they’re great, but I think the hardworking people, like when we went to Los Angeles years ago, we were producing a little film, Vic and I, privately, and because Vic was interested in animation, we visited an animation studio in Los Angeles, and the fellow who showed us around the animation studio was a very, very well-known animator and he worked with Disney for a while. But he says it was such hard work, and it was a factory, but then there’s people who thrive on that kind of work and they enjoy it, and they stay with it for years and they’re all so talented. The idea of being hired by a big company is a thrill. Disney approached me when they had an office in town here, and they wanted me to create some background scenery for The Sorcerer’s Apprentice. BWB: I was thrilled to death that they asked me, and I just thought oh my goodness, you guys just don’t know how slow I work. You haven’t got a clue. I’m not the artist for you. I was just thrilled that they were very keen on getting me to do the backgrounds for Mickey. Yeah, so I think they were attracted to the colours and the details that I do, and that was a thrill, to be invited, but I had to turn them down. EM: Have you ever dealt with any conflicts being a woman in the art world? BWB: I think initially, when we moved to Victoria, our experiences were such that there [were] mostly galleries that were showing art by the male population, and that was pretty standard at that time. But one of these two wonderful ladies, Heather and Sheila, they’re two sisters, and they own the Media Gallery. They were on Yates Street, and they decided that they would have a women’s show. There was myself and Phyllis Serota, and oh, I must find the invitation. I think I saved one of the invitations so I could remember all the women that were in the show. BWB: It was such a delight. It was such a special time for us, that I think they had a number of women shows, and there [were] write-ups in the newspaper about … I don’t think they said, “Oh, it’s a women’s show,” it was just a group of artists that were showing together, and it was just so refreshing for us to have this moment where we were all together and we felt like we were pioneers. But that’s only 1978, and so that was a big deal for us, to have a show, just women artists. BWB: Yeah. I just felt so excited that we were invited to do that, and Pat Martin-Bates from the university came down to the opening, and gave us all roses, and so it was really, really special. EM: You have a connection to Victoria’s sister city, Morioka, how did that come about? BWB: Vic and I, especially Vic, who’s studied Japanese culture for ages, and was very much into Japanese folk law and kabuki theatre stories, and did a lot of art based on his interest in Japanese culture and folklore and samurai, we were so amazed when our sister city of Morioka Japan came in the mid 80s, and they put together a large parade float that represented their celebration that they would have every year. They built the float here and then paraded it through the streets of Victoria, like “We’re from Japan, we are your sister city of Morioka,” and Vic and I attended this and we just were [gasp], just absolutely so excited to see them make the effort to come all the way to Victoria Canada to share one of their cultural events with us. BWB: I was just thrilled to death, and I just thought oh, how can we give back to them? How can we give back to this gracious city that we’re now connected with? So, Vic and I planned a trip to Japan, to Morioka. What I did was, the mayor at that time, she wrote a letter of introduction for myself and Vic, to go to City Hall in Morioka and present the letter of introduction, and say that we’re both artists. When we arrived in Morioka, I gave them the letter of introduction plus a gift of my art. BWB: This was a big surprise to them because here’s these two travelers that show out of the blue, and I thought well, we’ll just make an appointment and we can do a formal presentation of my gift, which was a portfolio of a number of my paintings I did of Victoria neighbourhood scenes, and I thought well some people just don’t get a chance to get over here, so maybe they could see what our little neighbourhoods were like through my portfolio of photographs and paintings of mine. I just spent such a long time putting it together and I was so excited and I did a watercolor as a gift, of one of the scenes along the houses on Dallas Road. There were just four different houses, different types of architecture, but they all had the character of Victoria. BWB: We did get to meet the deputy mayor and we had an interpreter, and our interpreter saved our [lives]. We had no idea how many people would speak English. But we were shown into the conference room and I made formal presentation to them, and they were so gracious. They were so absolutely taken back because this isn’t the way they do things. You should make an appointment. I learned that [you should] always make an appointment. BWB: But anyways, we were an oddity in the sense that we just showed up there and did that, and we got to meet some wonderful people. They took us out for dinner and they made sure that we were comfortable during our visit, and so all the people that we met, we bonded with because there was enough English speaking friends and staff at City Hall that it just was our moment to connect with the city. So, through that gift that I gave, it opened up a whole world for Vic and I, so they invited us to have an exhibition of both our artworks in 1989. BWB: We were there in ’87 and for the presentation, we arrived in ’89 for our exhibition, and we met even more people. We were introduced to the city planners and artists and the athletes of the city, and so they just made us feel so welcome. We were on the radio and in the newspapers, and so it was important to them. It was so important to them to share the fact that they had visitors from their sister city of Victoria, and I just thought wow. Today, this still goes on. There’s still lots of people that are coming to Victoria, and we’re still connected with a lot of those people. EM: Yeah. I saw a photo of you with Mayor Lisa Helps. BWB: Yes. They were so kind to give my gift, or give the Beach Drive piece to them as a gift. Yeah, they really cherish the friendship that we have, and I really want Victoria to cherish the friendship that we have with that city as well. I’m sure because we work on our own and we work in isolation, we don’t participate as much as we used to, because we just have to be able to just keep our lives simple and don’t get too complicated, but I love the relationship that we developed with them. Barbara Weaver-Bosson, Looking South to the Blue Bridge, 2012. Acrylic painting. 15.5 x 28 inches. EM: What does your art mean to you? BWB: I think my art is all encompassing. Because we live in our studio, we wake up to it. We – Vic and I – just have this world of saturated in art, and all of our expressions and all of our thoughts and all of our ideas, it is our life. Vic did a number of artworks, Vic and I collaborated with a number of artworks, under the Art Life title, so if you ever see anything under Art Life, it was collaborations by Vic and I because that pretty well explains what we have is an art life. BWB: But you’re working things out in your mind all the time, you’re thinking about your projects, hoping that you can get more time in to paint or keep focused, so it’s like life is short. It goes by pretty fast. Yeah, we don’t have to go far to start work. BWB: Yeah, so anyways, working here, it’s so convenient, but you’re in it all the time. It’s what you think about day and night, so we have to leave town to get some rest. That’s why we were gone for five days. We have to get some rest. EM: Your husband, Victor, is an artist as well, is that advantageous to have somebody to bounce ideas off of and be creative with? BWB: Yeah. We get up and we start laughing every morning because he has got such a wry sense of humour, and a lot of his art has a little bit of a twist in it. It always makes you think about what his message is. We just discuss things all the time, and we support each other. I help him do his print runs or his productions, and we collaborate. This one over here, which is called The Darth Vader Trio Play the Belmont, this is the series of panel pieces that we did together. BWB: This is my photography [and] we’ve added 30 hidden things to the image, just to make it more surreal, but it’s familiar. You see that that’s the Belmont building down on Government and [Wharf Street], but we’ve got chickens in there, we’ve got cows, we’ve got Darth Vader up here on the entrance, playing his fiddle, and Storm Troopers and little messages about digital art. There’s a goose in this back seat of this car, that’s sticking his head out the window. We just had a lot of fun with the idea of imagination, and things in place and out of place. BWB: Yeah, so the Darth Vader Trio, he is the busker that plays the fiddle down town, or his violin, and he’s just amazing, so we made him a band. He’s entertaining these people. But so we did several of these different panels with all the different things, or several collaborative pieces. I like the panel idea where it breaks up the space. EM: How does the idea for this come about? BWB: Well, I think when I wander around and I’m taking snapshots, and there’s something about an image that I’ll show to Vic and I say, “Can we work with this?” He says, “Yes, we can work with it.” We’ll take the time and we’ll spend … This probably took about three months to do, to get all of the digital images overlayed into each of the windows and the streets and the cars. Then once we printed it out, I could work back into it with a bit of colour and some gels, and just to make it have depth. But yeah, so there will be a number of pieces [where the] starting point came from maybe one of my photographs. BWB: Yeah, because we were always taught to be imaginative in art school. Use different mediums, try different things, and even though I’m known for my neighbourhoods, this still has a neighbourhood connection for me. It also lets Vic’s talents shine through, and the way he can montage several different characters into a new piece for us. EM: I like that it looks like a regular photograph from far away, and then it’s that thing where if you get closer, you learn a lot more. BWB: Yes. That’s the idea of perception, and when I do my paintings, I’m giving an impression of the city or the water’s edge and the residential area, but I inject imagination and colour and some of the little stories that I put on to the street, with people and beach areas. But yeah, telling stories about your own community. EM: Yeah. What do you hope people take away from viewing your artworks? BWB: Well, I hope that I’m translating the joy I feel about living in our city, and how much it means to me to have such an amazing surrounding with the water and the mountains and the character houses, and just the sense of calm and beauty and joy I feel. I’m wanting to translate what I feel about our city. EM: What are you currently working on? BWB: I started [this piece] a while back and I keep coming back to it in between the projects that I’ve finished, [to] get some time to focus. Because of the amount of detail in it, it’s quite an investment of time. 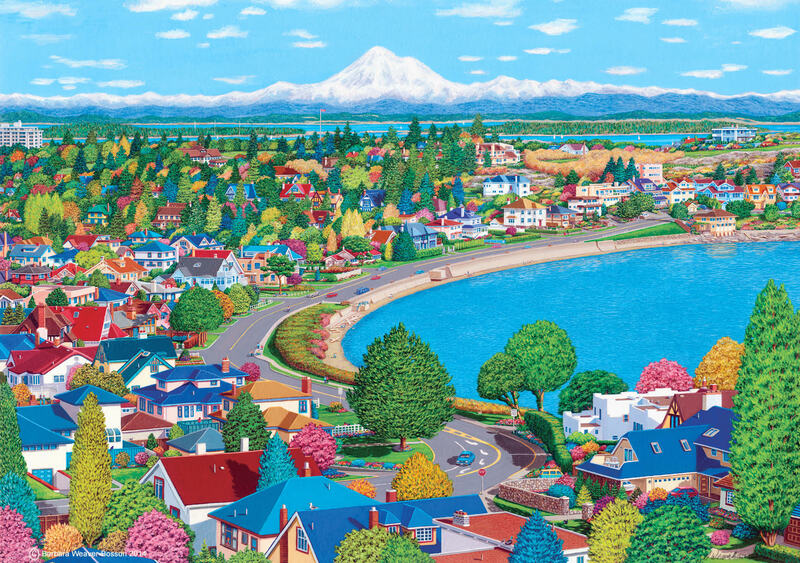 The scene is from Walbran, and I’m looking down on to Gonzales Bay, the beach area, and looking southwest to Ross Bay, Clover Point, and the residential area where Vic and live, and towards Downtown. I think all of the details that I’m doing [are] just so exciting for me, but I hope my eyes hold out because of the amount of small structures that I’m painting. BWB: But I do take out trees in an area, so I can see a little bit more of the roof lines, because if there’s too many trees that are making a mass area, I find that the rhythm of the way that your eye moves through the painting might be stopped if there’s a big treed area. I’ll always go back to the street level, draw what’s hiding behind those trees, and that way I can just add a few roof lines and maybe the faces of some houses, that just give me that sort of look that I’m after. Again, using my imagination. EM: Yeah, you mentioned how you took out trees in front of your house, so you could just see your peak coming through. BWB: Yeah. Imagine that tree hadn’t grown that tall. Trees just grow so incredibly fast, so just looking over some of the viewpoints, I’ve always oh, I can’t see those houses anymore. Oh dear. EM: Yeah. Do you have any last thoughts to add to our conversation? BWB: Well, I think what [the] university is doing and what you’re doing as an art historian is just wonderful, because artists live in isolation because we do focus on our art day to day, and if you’re a member of a community of artists, you get out more. If you go to galleries for openings you get out more, but again, artists aren’t having those conversations with each other about what their background is, and the general public doesn’t get a chance to hear what the life of an artist is. It varies. My life is totally different than somebody else’s life in their studio, and so I think it’s great because you can individualize the process of every person that you’re interviewing, and give a little bit of a glimpse into what it’s like and how did we start. BWB: We all start with an idea that we just want to keep being creative until the end of our lives, and your passion just carries you, and so the more people know how passionate people who do art are, then it might catch on and art will be everywhere, and art will be appreciated everywhere because there’s a lot that goes into being an artist and surviving that whole process of being able to maintain your expression, and keeping it out there for people to enjoy. EM: Yeah. That’s the goal. EM: Thank you so much for agreeing to do this and I’ve really enjoyed speaking with you today. BWB: Oh, thank you Emily. It’s a pleasure to meet you. Amos, Robert. “Love of Architecture Inspires Landscapes.” Times Colonist, Jan 18, 2007. ProQuest, http://search.proquest.com.ezproxy.library.uvic.ca/docview/348088375?accountid=14846. Hawthorn, Tom. “In Victoria, an Artist of the Sun Brings Colour to a City of Grey.” The Globe and Mail, Apr 30, 2012. ProQuest, http://search.proquest.com.ezproxy.library.uvic.ca/docview/1010217627?accountid=14846. Pogue, Liz. “Artist Couple Illustrates What Society Is All About.” Times Colonist, Aug 08, 1996, pp. 1. ProQuest, http://search.proquest.com.ezproxy.library.uvic.ca/docview/345659304?accountid=14846. Weaver-Bosson, Barbara. Barbara Weaver-Bosson. 2018, http://www.weaver-bossonart.com/. Accessed 7 Oct. 2018. Weaver-Bosson, Barbara. Barbara Weaver-Bosson’s Art, Life and Stories. 2013, http://www.weaver-bosson.blogspot.com/. Accessed 7 Oct. 2018.